Communal living is not a new phenomenon. In fact, it dates back to our hunter-gatherer days, when there was no hard and fast definition of household, and family groups were more interdependent. From the rise of large households during the agricultural revolution to the growth of single-person households today, it’s clear that our cohabitation patterns are always changing. You may have heard the term “cohousing,” but do you know what it truly entails? If you’re curious, keep reading to learn how communities are formed, what a cohousing development looks like, and why communal living is becoming more popular. The Cohousing Association of the United States defines it simply as a “form of intentional community.” In essence, a cohousing development refers to a group of like-minded people willing to plan and build the community they want. 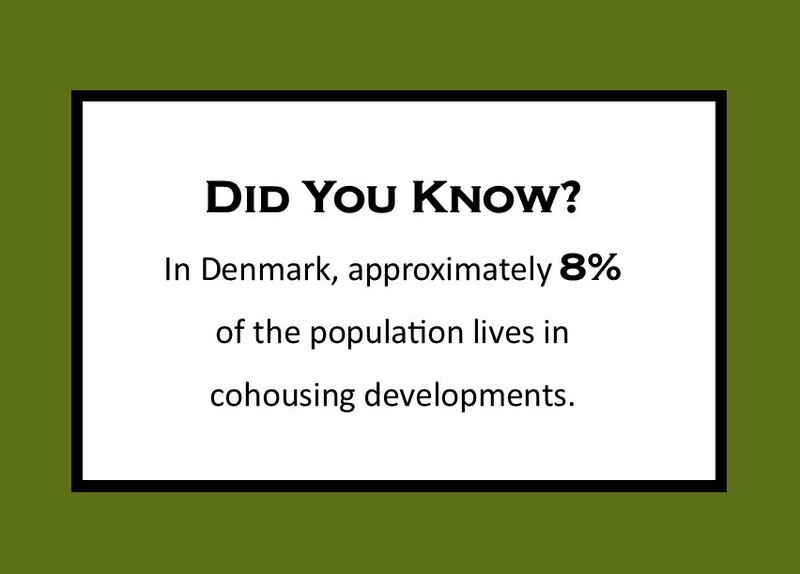 The modern concept of cohousing emerged in Denmark in the 1960s. A group of families developed the first modern cohousing community to recapture the seemingly lost values of trust, support, and collaboration, particularly in regards to sharing the burden of childcare. The idea took off, and cohousing developments sprang up across Europe and began to appear in North America in the late 1980s. These developments are not nearly as popular here as they are in Europe, but they are becoming more so, particularly amongst seniors. The main benefit of cohousing is having a tight-knit, interdependent community at your doorstep, although it’s important to note that not all aspects of life are communal. In fact, one of the principles of cohousing ideology is the importance of balance. Privacy in the home supports your life in the community. Residents typically participate in both organized and spontaneous events. Just like any wider community you can be involved in fitness groups, book clubs, or crafting circles, in addition to regularly sharing meals and leisure time. Residents help each other out by giving rides, carpooling, and sharing child-minding duties. If one individual has a specific skill, such as accounting, they may help others with bookkeeping or filing their taxes. Residents also divide tasks such as maintaining and repairing the common areas, and often assist each other with larger home maintenance tasks. What Does a Cohousing Development Look Like? Cohousing communities are often formed based on a shared religion or background, environmental view, or social ideology. Neighborhood design can facilitate a sense of community and reflect the vision of any given community (such as ecological living). As such, the future residents of any cohousing community help to design it, working with developers, architects, environmental consultants, and contractors to build the development from the ground up. Cohousing can be rural or urban, and a community typically consists of 15-35 self-contained households, the idea being that fewer households leads to a more close-knit community. The homes are clustered together, and the front doorways often look toward the common area or common house. The units are smaller than the average home because so many tasks and day-to-day activities are done in the common area. Cars are usually parked on the outer edges of the cluster. Common areas can vary widely based on the community’s shared values. For instance, some communities might have a church or prayer room on site, while others have a small school to homeschool their children. Most common houses contain a large kitchen and dining room, rooms for committee meetings and leisure activities, a children’s playroom, guest rooms, and a communal laundry room. The outdoor common area may have a large communal garden or even a farm, a playground, a pool, or other amenities. How is a Cohousing Community Managed? Cohousing functions much like the ownership structure of a condominium, where the individual units are privately owned, but common areas are jointly owned. The ownership structure is typically a homeowner’s association (HOA), condo association, or housing cooperative. In Europe, there is a growing interest in rental cohousing, and as renting becomes more prevalent amongst singles, the concept is expected to migrate to the US. Residents are responsible for managing and maintaining the cohousing community, and for the most part, management is non-hierarchical. Rather, residents take on roles based on their skills or interests. Any decisions are made by consensus, meaning no member has sway over another. New residents are usually admitted after a vetting process that ensures they understand their role in and responsibilities to the community. In fact, some communities offer a rent-to-own option to give people the chance to see if cohousing is the right fit for them before committing to a purchase. When it comes to living arrangements, our aging population faces issues of affordability, accessibility, and quality of life—particularly loneliness. Cohousing can be a solution to all these problems, and so both seniors-only and multigenerational cohousing are becoming an increasingly popular option for seniors. For one, seniors get to keep their independence, a luxury not afforded in many long-term or assisted-living facilities. They maintain a private residence and tend to their own needs, but there is often an on-site caregiver to assist with housekeeping, maintenance, and food preparation. Alternatively, residents may provide co-care, trading favors or working together to complete daily tasks. Individuals who require a higher level of care may have a live-in caregiver. Most importantly, cohousing helps to combat loneliness. Widows, widowers, and seniors whose families live far away are particularly likely to be lonely, and living in a cohousing development offers endless opportunities to socialize, from sharing meals to sharing hobbies. Overall, senior cohousing offers not only a sense of community but also purpose, dignity, and safety. Although alternative ways of living have been around for years, there has been a surge of interest in cohousing in the last several years. Whether it’s to save on housing and childcare costs, to live more sustainably, or to reduce feelings of isolation, cohousing can be a solution for a number of problems our society faces. And while cohousing may not be for everyone, its growing popularity may lead you to reflect more on where and how you live now. Hi Jessica, I am fascinated with the concept of cohousing as community is a big passion of mine. I hope to live in multigenerational cohousing one day, further down the road! It would be great, wouldn’t it, if municipalities designed neighbourhoods in the way cohousing is designed, so that opportunities for community building were there. I love that the idea of renting in cohousing is growing in Europe and I hope it comes to North America. Would you try cohousing, Jessica? I agree that community building should be factored into urban and neighborhood design. It’s great to hear that you’re interested in trying it one day. I initially had misgivings, but after doing some research and learning about the variety of cohousing options out there, I would be much more willing to try it! Widowers and seniors? Are widows not allowed? An oversight on our part; we are now adding “widows” to the list.